Dr. Sylvia Rhue is the Executive Assistant to Bishop Yvette Flunder in Oakland, CA. She has worked as the Director of Religious Affairs for NBJC (National Black Justice Coalition), Director of Equal Partners in Faith, and Assistant Director of Counseling at the Los Angeles Gay and Lesbian Center. She has a doctorate in Human Sexuality, an MSW from UCLA, and is a writer and film maker. ​Her passion for social justice began in 1964 when she met Dr. Martin Luther King and was inspired to become a door-to-door fundraiser in support of the Civil Rights Movement. 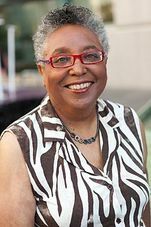 In 1988, she helped found the Black Gay and Lesbian Leadership Forum with the Black AIDS Institute’s Founder and Executive Director Phill Wilson. She is the co-producer of the award-winning film "All God's Children" and is an expert on the "ex-gay" movement.